The NATF Atrial Fibrillation Action Initiative is a 3-year project to identify multidisciplinary best practices for stroke prevention in atrial fibrillation (AF). 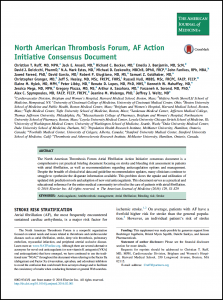 NATF’s mission is to provide a comprehensive yet concise consensus briefing document focused on stroke and bleeding risk assessment in patients with AF, as well as recommendations regarding anticoagulation options and management. We intend this cohesive and practical educational document to serve as a reference for the entire medical community involved in the care of patients with AF: primary care, emergency medicine, pharmacology, and cardiovascular medicine. Despite the recent increase of clinical trial data and guideline recommendation updates, many clinicians struggle to synthesize the disparate information, inhibiting utilization of updated risk prediction tools and adoption of novel oral anticoagulants. The goal of the AF Action Initiative is to synthesize the current information into one usable resource for clinicians and patients.